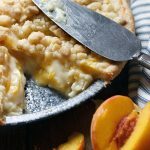 A delicious fresh peach pie, with a creamy peach filling and a shortbread crumble topping. In a large bowl, toss the peaches with the filling white sugar and flour. Stir in the sour cream. Spoon filling into unbaked pie shell, then place pie shell on a baking sheet. In a medium bowl, stir together the topping ingredients (except butter). Stir in melted butter with a fork until you have evenly moistened crumbs, with just a few larger pieces. Scatter topping over pie filling. Bake in 425oven for 15 minutes, then reduce heat to 350and bake a further 35 minutes, or until set and golden. (*Note - check the pie after 25-30 minutes in to the 350bake time and cover loosely with aluminum foil if topping is golden enough at that point.) Allow to cool to room temperature. You can refrigerate and serve cooled as well.